Hundreds of guests including families of the 190-strong ship's company attended a colourful 'christening' ceremony at Portsmouth Naval Base which marked the ship's transition into front line service. Reflecting her strong Welsh connections - the ship is affiliated to the city of Cardiff, among the principal guests was the Secretary of State for Wales, Cheryl Gillan. Also present were Susie Boissier - the ship's sponsor who launched the vessel at BAE Systems' Govan shipyard on the River Clyde in November 2008 - and the Second Sea Lord, Vice Admiral Charles Montgomery. The ceremony was conducted by the Venerable Scott Brown, Chaplain of the Fleet. Representatives from the ship's affiliated city of Cardiff were also present. "This very special day marks the end of our trials phase and the transition to front line service. "Thereafter the emphasis will be on combat readiness in preparation for our first deployment next year. I am very pleased that so many families, friends and affiliates were part of our momentous day." The ceremony was rounded off in traditional Royal Navy fashion with the cutting of a commissioning cake. Performing the honour were the Commanding Officer's wife, Liesl, and Engineering Technician Mark Soldiew, aged 18, the youngest member of the ship's company. HMS Dragon is the fourth of six Type 45 destroyers being built for the Royal Navy. All will be based in Portsmouth. 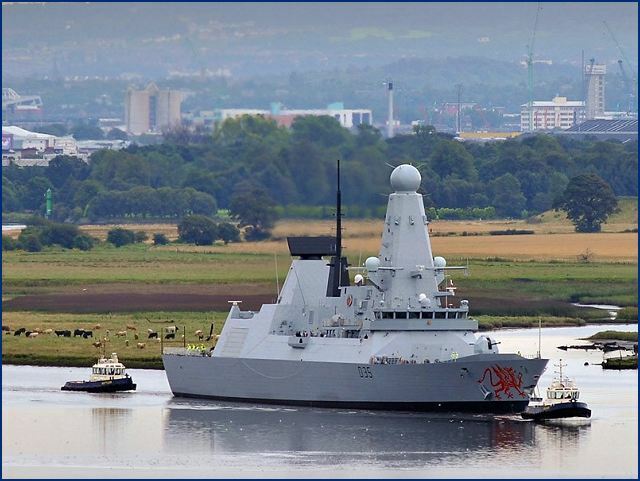 The first, HMS Daring, was commissioned in July 2009 and the fifth, Defender, is due to arrive in Portsmouth for the first time this summer. All six are scheduled to be in service by the middle of the decade.